First there was Battle Cat, then came Gygor, the Shadow Beasts, some giants, Panthor … and now finally She-Ra has her noble steed Swiftwind. She’s more of a unicorn, but this is the first horse “buck” in the line and it looks fantastic. Even putting those Lord of the Rings horses people had been using in their place. In such a testosterone filled line, how does the rainbow flying horse stack up? It’s always exciting in such a heavy reuse line such as MOTUC to get a completely new sculpt/character. Swiftwind is the line’s first foray into the equestrian circuit, and like most beasts in the line (giants withstanding) they knocked it out of the park. The sculpt is very solid for the horse, very detailed muscle definition, skin folds, and veins. 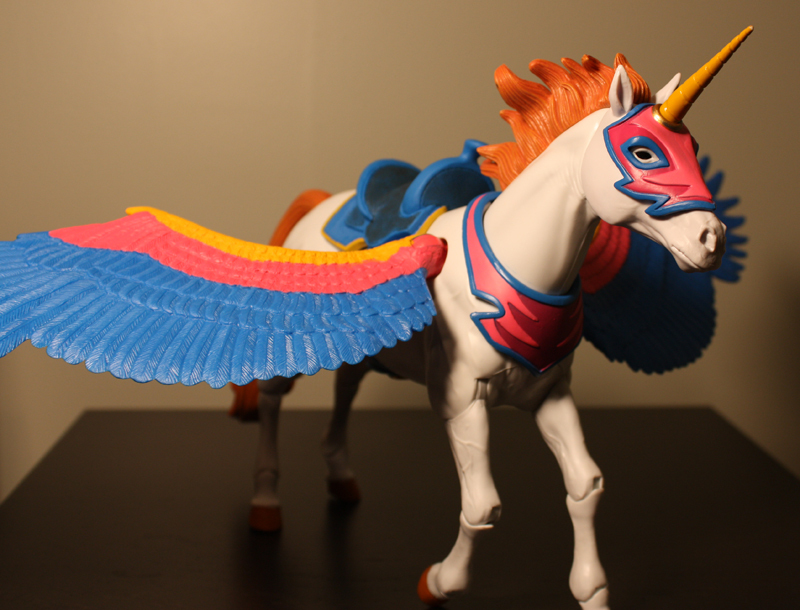 Swiftwind comes with her wings unattached and they plug into holes on above her front legs. She has a removable mask that also removes her unicorn horn, but gives her a straight horse face. Each leg has three cuts of articulation, at the base of the leg, knee, and right above the hoof. The neck is also articulated at both the base and the top. Her tail and wings both have ball joints at their bases allowing a free rang of movement for those appendages. Now that She-Ra has undergone her revision, she sits perfectly upon Swiftwind’s saddle … her hair kind of blocks her from looking up, but we can’t hold that against Swiftwind. All in all this is a great figure, and adds some color and variety to the Masters of the Universe Classics collection. There will still be the detractors that say she is “too girly” for the line, but there is probably no helping those people. I can only imagine if they went with the pink color scheme what people would be saying.